Sidney Crosby scored a goal last night to send the Penguins to overtime, allowing them to earn a point against the Calgary Flames to move them into a tie with the Washington Capitals in the Presidents' Trophy race. If it felt like it had been awhile since Crosby lit the lamp, it was his first goal in eight games. If it feels like it's been bigger than just that, it's because it has been. It's hard to deny that Crosby has gone through a goal scoring slump since the calendar turned to 2017, managing only 9 goals in 30 games. It's a pace (24.6g per 82 games) that rivals the production Crosby managed playing under the restraints of Mike Johnston's offensively stifling system, when he scored 34 goals in 104 games (26.8g pace), including just 6 in the final 27 games (18.2g) he played for Johnston last season. It's also a bit surprising, as the slump comes on the heels of what had been one of the more prolific scoring sprees of Crosby's career. Up until the New Year, Crosby had been scoring seemingly at will whenever he hit the ice, totaling 26 goals in 32 games, a pace of 66.6 goals over the course of an 82 game season made more impressive by the fact few players break the 40 goal mark anymore, let alone top 50 or even flirt with 60. It was inevitable that Crosby wasn't going to continue scoring at the same rate, but he's gone through both extremes in roughly the same number of games. 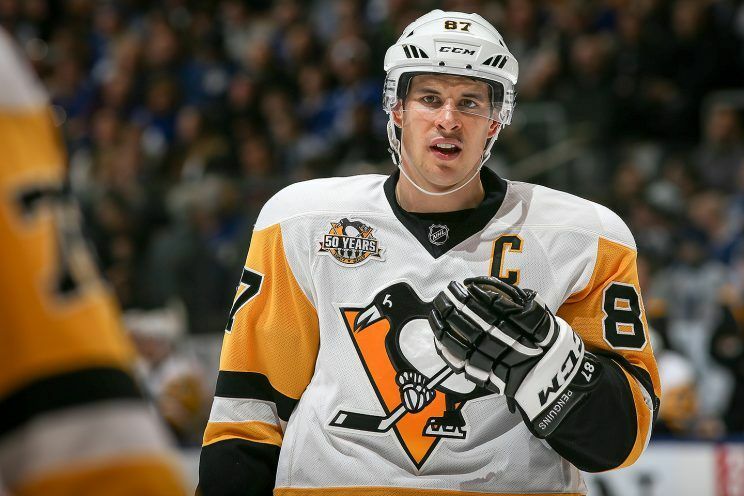 The first half of the season is easy enough to explain - Sidney Crosby is a supremely talented player who is capable of reeling off an incredible number of goals over a short-to-medium range of games. The second half of the season is easy enough to explain as well - goal scoring is streaky, and even the best players can and do go through stretches where they struggle. Just look at Alexander Ovechkin's recent stretch of play. Arguably one of the greatest pure scorers the league has seen, and certainly a consistent one too, Ovechkin's rolling average would bottom out at zero on the chart above due to his current 10 game goalless streak. He's gone 18 games without scoring an even strength goal, with two power play markers over that span. While Crosby has 9 in his last 30 games, Ovechkin has only 7. But with the playoffs quickly approaching, it becomes less about what you've done and more about what you're going to do. And while Crosby's talent alone makes it difficult to worry too much about any scoring drought, recent developments make it more a question of when, not if, the goals will start to pile up again. First and foremost, Crosby has responded by trying to shoot his way out of his slump. From his low point of attempting 4 shots per game over a 10 game stretch at the beginning of February, Crosby has generated significantly more attempts over the past month and a half, currently averaging 6.7 iCF/gm over his last 10 games. Seeing as he's the most dangerous player on the ice, it's never a bad thing to see Crosby focus on shooting more. But it is a bad thing for the rest of the league to see Crosby clicking with wingers who can complement his game while flashing skill and creativity of their own. Though it's only been a small handful of games, the recent Sheary-Crosby-Guentzel line has shown early signs of being a terror for opposing teams. Both Sheary and Guentzel possess speed and good hands, but their ability to think the game and read Crosby has helped the trio develop instant chemistry. With a goal against the Flames, Sheary has now hit the 20 goal mark in his 2nd season (in 48 games) spending 533:02 of his 655:15 minutes of 5v5 TOI (81.3%) with Crosby. Guentzel has played more throughout the lineup, but being less than a year removed from suiting up for the University of Nebraska-Omaha he's posted 10 goals (in 31 games) after obliterating the AHL competition during his brief sting in Wilkes-Barre with 21 goals in 33 games. The Penguins won the Stanley Cup last season after steadily improving their game under Mike Sullivan to the point where they became a thoroughly dominant squad to go up against. While this year's team hasn't consistently shown the same level of play yet, the signs are there that they could be ramping up for another special run. Despite an injury situation that has kept a number of talented regulars out of the lineup, the team strung together a five game winning streak before dropping in the shootout last night against the Flames. The recent additions on defense should allow Sullivan to find a group that will be able to handle the rigors of the postseason. 9 of the team's final 14 games come against teams currently outside the playoff picture, and Evgeni Malkin has already pushed it into overdrive with 9 goals and 4 assists in his last 10 games. The signs point to Crosby busting out of the recent scoring drought and putting up the goals in bunches. And if the Penguins have both a red-hot Crosby and a red-hot Malkin, it'll be difficult for any team to deny them in their defense of the Stanley Cup.